The Spamfilter Whitelist Addresses list contains sender email addresses which you want to be allowed through the spam filter. VPOP3 checks the From, Reply-To and Return-Path addresses. By default, whenever a local user sends a message to an external email address, the recipient is added to the whitelist. This can be disabled by setting the AutoWhiteList spamfilter setting to '0'. •The Added column shows whether the address was manually added by someone typing it in, or opting to add it when releasing a message from the spamfilter quarantine, or automatically added when someone sent a message to that address. •The Last Added column shows when the address was last added (addresses may be automatically added multiple times, because they are added whenever someone sends a message to that address). 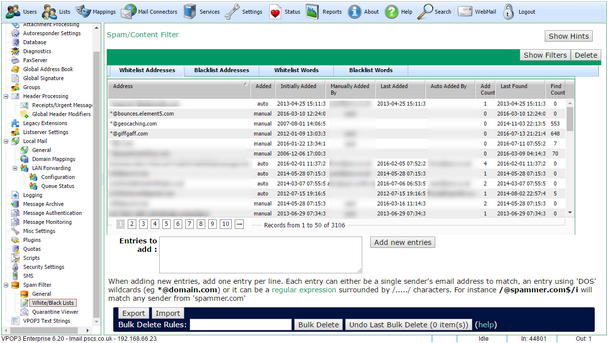 •The Auto Added by column shows the latest sender who caused the address to be automatically added. •The Add Count column shows how many times the address has been automatically added. Note that when you add a new whitelist entry, VPOP3 will go through the quarantine and automatically release any already quarantined messages from that sender. Also,note that, by default, VPOP3 will ignore whitelist entries for local senders. That is because these are not usually used as the senders for legitimate incoming email. You can change the CheckLocalWhitelist entry in the spamfilter script configuration to change this behaviour. The Show Filters button will display boxes in the table headers where you can type search criteria. In the Add Count/Find Count filter boxes you can use numerical expressions, such as '<10' or '>100' etc. The Export and Import buttons let you export or import the whitelist entries to a text file. The Bulk Delete Rules let you specify a rule to delete many whitelist entries at once.